A Fine Gael member of Athlone Town Council is trying to have a state-owned piece of art removed from a public art gallery. 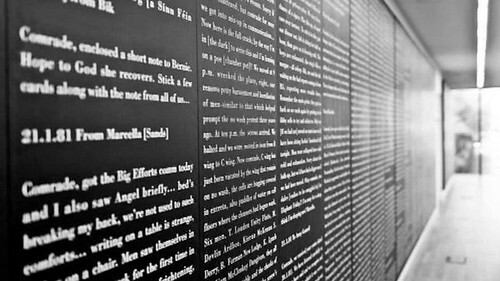 The artwork in question Fragments sur les Institutions Républicaines IV by Shane Cullen features transcripts of messages written on cigarette papers and smuggled in and out of the Long Kesh Prison by members of the IRA during the H-Block hunger strikes and dirty protests in the late 70s and early 80s. The work was made in the mid 90s and is part of the collection of the Irish Museum of Modern Art and has been exhibited numerous times in the Republic of Ireland, Northern Ireland and overseas. The story first came to light when former Fine Gael Minister for Justice Paddy Cooney voiced his objection to the piece after seeing it at the launch of the gallery. In an article in the Westmeath Independent the former minister is quoted as saying "First of all, I don't think it is art and secondly, the theme is inappropriate. If it was removed I'd shed no tears." The article (dated 6th December) claims that he sought ought the gallery manager to request the removal of the piece. Cllr Mark Cooney (FG), the son of Paddy Cooney, tabled a motion calling for the removal of the work from the Luan Gallery in Athlone. This motion was discussed on Monday 7th January at a meeting of the council. During this meeting Cllr Cooney, compared the work to a piece glorifying Hitler "extolling the merits of exterminating the Jewish population". Unlike his father Cllr Cooney acknowledged that the work may have artistic merit but said that censorship is sometimes necessary to protect children. Cllr Gabrielle McFadden also of Fine Gael supported Cllr Cooney saying that public galleries should not show politically contentious art. Independent Cllr Sheila Buckley Byrne suggested the matter be referred to the board of Athlone Art and Heritage of which she herself and at least one other councillor are members. The Councillors voted in favour of this proposal. The board have stated they had not been aware of the content of the exhibition as that is left to the gallery manager. I am hopeful that the board will do the right thing and ignore this suggestion that they censor an exhibit. However, if the artwork is removed, I would suggest that artists should then announce their intention to boycott the gallery until the decision is reversed or if it is too late for that until the board issue an apology and provide assurances that no further acts of censorship will be carried out. The Westmeath Independent's live blog of the meeting is worth reading. The Irish Times coverage of the dispute, on the other hand, has been disappointing with no mention of the Nazi comments, the comments regarding the necessity of censorship, or the assertion that politically contentious art should not be shown in public galleries. Update 09/01/13: The Westmeath Independent have published a list of board members of Athlone Art and Heritage. The chairman of the board is Labour councillor and Athlone Mayor Jim Henso. The board also includes Cllr Kevin 'Boxer' Moran, and Cllr Sheila Buckley Byrne. The board will meet next Tuesday 15th January. Update 15/01/13: The Board of Athlone Art & Heritage has decided not to seek the remove of Shane Cullen's work from the Luan Gallery. The Board has full confidence in the current management and curatorial arrangements in relation to the Luan Gallery. It would not be the intent of the Board to direct the removal of any artwork from a public space which would deny visitors to the Gallery the opportunity for respectful, critical and reasoned enquiry and debate. Below is a video of the artist Shane Cullen being interviewed directly after attending the meeting of Athlone Town Council.